Leading Manufacturer of vibration mill (ss ball) from Thane. Being a quality centric organization we are dedicatedly engaged in offering our valuable clients a vast assortment of Vibration Mill. This vibration mill is developed from superior grade components as per the set industry standards under the direction of experts. The offered vibration mill is suitable for mixing KBr with sample using SS ball. 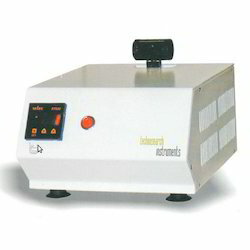 As well, our valued customers can avail this vibration mill from us at reasonable rates in a given time period.